On a cool autumn morning with frost on the ground, I quietly made my way to the river. A ghostly mist was still coming off the river's crimson sunlit waters. The silver sides of fingerling shad were dancing across the surface just about in casting range. I heaved my four-inch rapala into the center of the dancing school of fish. With a twitch of the rod tip, an explosion on the surface and a set of the hook, I was into one of New Jersey's feistiest gamefish, Micropterus dolimieui, the smallmouth bass. A fine two and a half pound specimen - a prize on any water - I returned it to the water from which it was born nearly a decade before. This same water hadn't seen another angler all morning, and the sound of the nearest highway was more distant then the E-mail on my computer. Many tranquil mornings can be spent on this slice of heaven: the Delaware River within the Delaware Water Gap National Recreation Area. This public land extends from north of Milford, Pennsylvania, south to the Delaware Water Gap on both sides of the river. 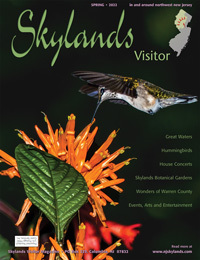 In the Skylands, there are several access points in both Sussex and Warren counties, including sites in the federal land as well as Worthington State Forest. As the water temperature begins to fall in early September the river begins to prepare for winter. This means the juvenile shad begin to school up as they make their way down towards the ocean. 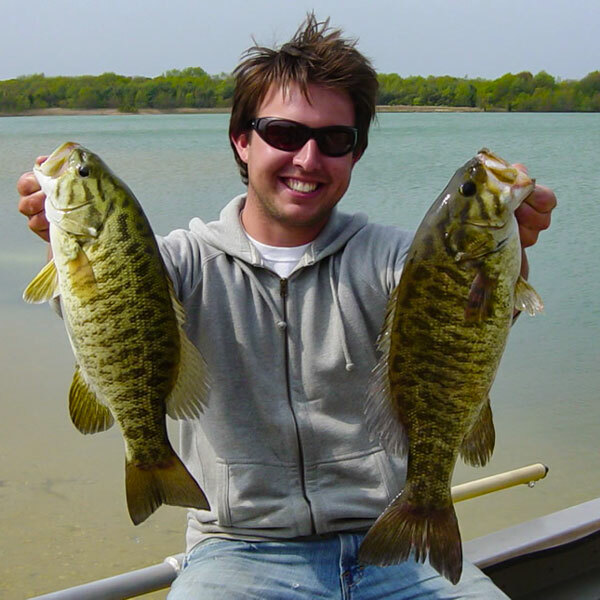 As a result, smallmouth bass school up in the deeper holes, feeding on the abundant forage. When this happens, floating and subsurface stickbaits, such as rapalas and rebels, are the most productive for active bass. With the river usually low and clear at this time of year, natural colors work best. Freespooling large shiners or shad on light line will trigger hits on a less then eager bass. Once all the shad are gone, don't hang your rod up. The best fishing for large fish is in mid to late October - even into November - when the fish are fattening up for the cold winter. Concentrating on the deepest holes, eddies and behind bridge abutments should yield results. Fish are attracted from miles around to these areas where they stack up in large numbers and stay the winter. Finding these key wintering holes is much more important then what you use. In these deep holes along rocky ledges the smallmouth feed on large crawfish. Large jigs and crawfish-colored crankbaits work best. For the live bait angler, crawfish fished slowly along bottom will offer the biggest bass. I prefer to hook the crawfish in the tail with a number six or number four hook on a slip sinker rig with a three foot leader. Aside from crawfish, shiners, nightcrawlers and hellgrammites rigged the same way will work fine. With clear water conditions and bass feeding predominantly by sight, use light line to keep bait looking as natural as possible and remember to slow down the presentation as the water gets colder. The bass in the fall run large, with fish in the two to three pound class common with larger ones possible. It is important to turn these large fish back to the water as they represent more than a decade of growth and the prime fish in the population's gene pool. Because all the bass from a several mile stretch of river hold in the same hole, it is very easy to overfish them if people refuse to turn them back. If one is looking for fish to take home for dinner, there are plenty of large rock bass, perch and sunfish in the river. These can be caught by scaling down your hook and bait size. This section of the river also is home to large muskellunge and trout, which will share the same wintering holes as the bass. The scenery is spectacular this time of year with peak leaf color usually around the second week of October. Keep your eyes to the sky for migrating hawks, eagles, ospreys and vultures. Black bears, deer, and wild turkey may also share the river's edge while you fish, adding to the total outdoor experience. But most of all, the river offers you peace of mind and a break from the chores not yet done at home. Information on fishing is available from the Division of Fish, Game and Wildlife at the Pequest Trout Hatchery and Natural Resource Education Center, 908-637-4125 or the Trenton office at 609-292-2965, and the Division's web site. The author, Keith Griglak, is a seasonal Naturalist with the state Division of Fish, Game and Wildlife and president of the Rutgers University chapter of Trout Unlimited.